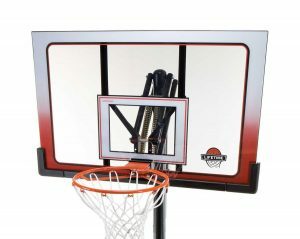 This portable hoop system boasts of a premium quality hoop with a poly-carbonate backboard supported by a steel frame. Height is adjustable via Action Grip Height Adjustment from 7.5 feet to 10 feet. It has a Slam-It Rim, which has double-compression springs suitable for dunking. 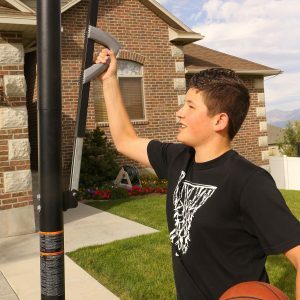 In this review, we will see how the Lifetime 1558 52 Inch Portable Basketball Hoop System stacks up. Installation is not that difficult especially if you have someone to help you. The instructions and labeling could have been improved but you can follow them with no problem. Some people have noted that they have needed some tools in order to complete the installation like drills, WD40, etc. Adjusting the height is a breeze on this thing. 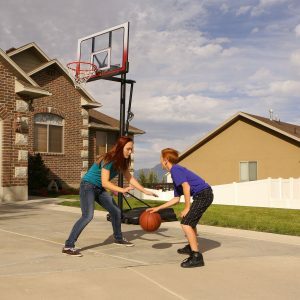 With Lifetime’s Action Grip Height Adjustment, even a child could adjust the height using just one hand. Range is 7.5 feet to 10 feet with 6 inch increments. This portable hoop system has 2 wheels for movability and is easily moveable as long as you remove water/sand from the base when moving. Otherwise it’s extremely heavy. 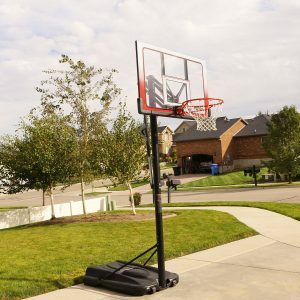 While it is not the best looking portable hoop out there, it’s quite alright. The powder coating on the poles are a nice touch, while also preventing rust. The backboard looks a little cartoonish due to the color. 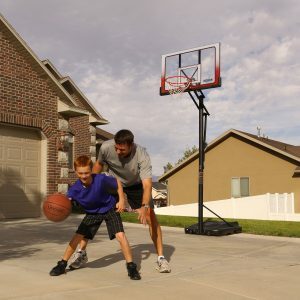 The Lifetime 1558 52 Inch Portable Basketball Hoop System is quite a good by for its price. It has its flaws but with its low price tag, these can easily be overlooked. 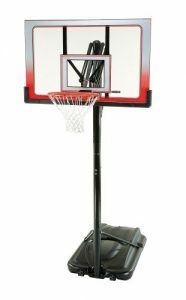 If you are looking for a high end hoop system, this is not for you. However for the budget conscious hooper, this is quite a good buy.